Happy Easter! I haven't participated in Baked Sunday Mornings for a while and hadn't planned on doing this week's recipe for Marshmallow Chocolate Cups either since I'm not that crazy about marshmallows. In the spirit of being open minded, I perused the recipe and was sold when the Baked boys mentioned their inspiration for it was Mallo Cups. Mallo Cups were one of my favorite candies as a kid. A cousin of the Reese Cup, they are chocolate cups filled with marshmallow creme. As you bite into one the marshmallow would ooze out and give you a perfectly good excuse to lick your fingers. My favorite part is the bits of coconut that are hidden in the chocolate top. I still love them but they are increasingly hard to find. When I come across them they always manage to find their way into my shopping cart. I was surprised at how easy these were to make. Painting the cups was a little time and labor intensive but I enjoyed the process. I stopped my mixer a couple minutes shy of what was called for in the recipe and my marshmallow was thicker than I wanted. Still tasty though. I added some toasted coconut as a homage to the Mallo Cup. To find the recipe and see what the other bakers did with this recipe, visit Baked Sunday Mornings! Your little mallo cups look great. I like that you put some toasted coconut on top. Happy Easter, Candy! Mallow cups - that's what I remember. Just never been a fan - but loved how these tasted. Maybe because they are homemade??? These look wonderful! So festive - and glad they were easy for this busy holiday. Love your toppings - what a creative idea! love your addition of coconut! your candies look delicious! great job! super cute! i didn't have the patience for minis, so i made mine in regular sized cupcake liners. I love coconut, and so I am dying to try a real Mallow Cup -- but your cups with the toasted coconut look so good -- yum! I love chocolate with coconut!!! One of my favorite pairings. 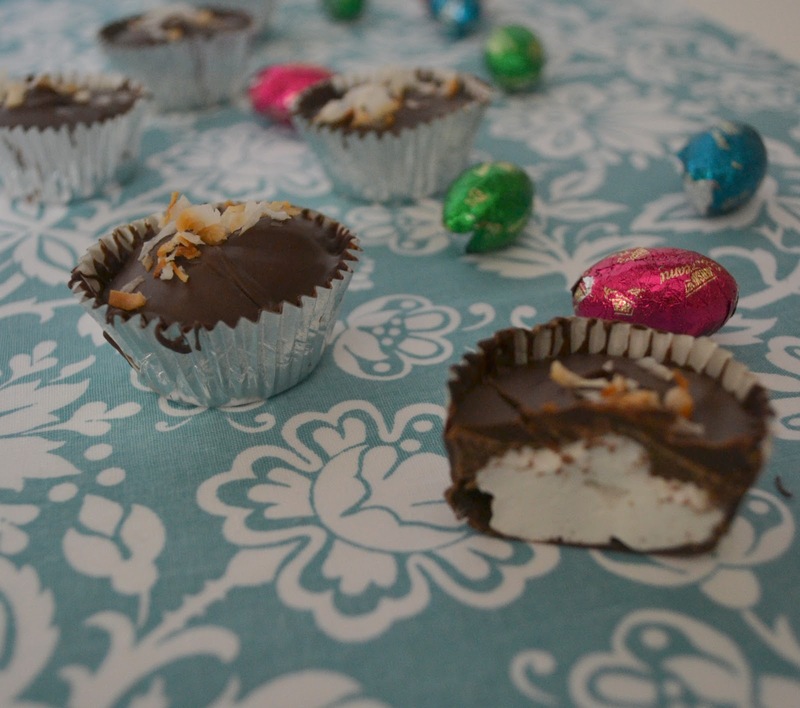 Your Mallo Cups look fun and perfect for an Easter basket. Very nicely done! I took a pass on these, but I love that you added toasted coconut. Great idea to add coconut. Your cups are so cute! Oh I need to put back this idea for a treat for the hubs. He loves marshmallow. These look great! I don't think I've ever had a Mallo Cup, but I can definitely get behind this homemade version. What a fun Easter treat!